Early on in Butch Cassidy and the Sundance Kid, a title card informs us that what we’re about to see is “mostly true” – probably because no one really knows what happened to the actual Butch Cassidy and the Sundance Kid. The most reliable account (and the one shown in the movie) would assume that the story ends in 1908. It may provide for the most justification of its characters when you think about it. This is the story of two outlaws, Robert “Butch Cassidy” Parker (PAUL NEWMAN) and Harry “Sundance Kid” Longabaugh (ROBERT REDFORD), who, when abandoned by their gang, flee to Bolivia. They’re not exactly sure where it is, but they figure that the local law won’t be able to find them there. Now on the run, they face obstacles and roadblocks in their trek, sometimes with Sundance’s girlfriend, teacher Etta Place (KATHARINE ROSS). The plot is without frills, driving the story ahead for 110 minutes with some well shot action sequences, especially in regards to the shootout finale. William Goldman’s script provides decent amounts of entertainment – a combination of thrills and wit. The main characters have good chemistry, as much of Goldman’s accomplishment as it is to Newman and Redford in their respective roles. Ross, who had just come off an iconic role in The Graduate (Nichols, 1967) does a decent but mostly unmemorable job here, another supporting part. 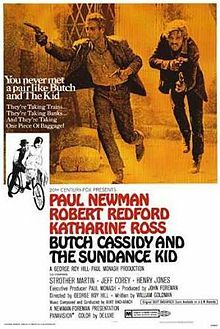 No word pressed against Butch Cassidy and the Sundance Kid will ever be able to dethrone its seat as a classic of Americana. Whatever I write will have little effect on the devoted, who will look upon this review with puzzlement and ridicule. But I just don’t see the love. It’s entertaining, yes, but it’s mostly forgettable and passive except for a few notable moments (like the final 15 minutes) – good for temporary time killing but hardly the makings of an endearing masterpiece. If nothing else, it’s a film to study on what is popular in America in both 1969 and 2013.